The Freedom From Religion Foundation will legally challenge President Trump over his “religious liberty” executive order today. The order and Trump’s repeated statements clearly communicate to churches that they can now endorse political candidates from the pulpit. FFRF’s lawsuit was filed on May 4 in the U.S. District Court, Western District of Wisconsin. 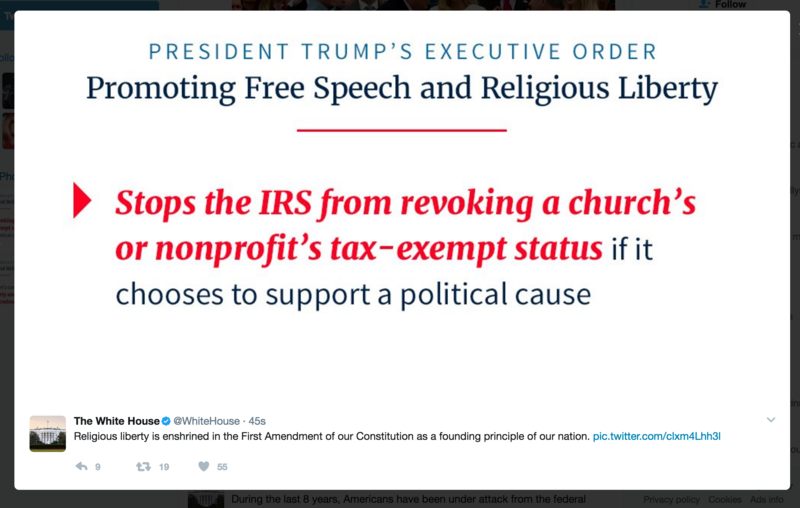 FFRF and co-plaintiffs FFRF Executive Directors Dan Barker and Annie Laurie Gaylor assert that Trump has used this order to usher in a new era of church politicking to the exclusion of secular organizations. Among its several abuses, Trump’s order and statements signal to the Internal Revenue Service that it should not enforce the electioneering restrictions of the tax code against churches and religious organizations, while permitting these restrictions to be enforced against secular nonprofits. FFRF asserts the president has no constitutional authority to selectively veto a legitimate statute that Congress passed and a president signed into law more than 50 years ago. This part of the law is known as the Johnson Amendment. Under the amendment, all organizations that are recognized as exempt from federal income tax under §501(c)(3) of the Tax Code are subject to the prohibition against political campaign intervention. Even if the precise language of the executive order does not accomplish Trump’s promise to “totally destroy the Johnson Amendment,” the impression his administration is actively trying to foster among evangelical Christians is that the IRS will no longer enforce the Johnson Amendment against them. The state/church separation watchdog sued the IRS in 2014 for its failure to enforce the electioneering restrictions and settled the suit after the IRS agreed to begin implementing these restrictions. FFRF has public opinion on its side. According to an evangelical polling group, Lifeway Research, whose slogan is “Biblical Solutions for Life,” nearly 80 percent of Americans say it’s inappropriate for pastors to endorse a candidate in church, and 75 percent do not believe it is appropriate for churches to publicly endorse candidates. As advertised by Trump, the executive order effectively provides preferential treatment to churches and will result in obligations on secular nonprofits, including the plaintiffs, that are not imposed on churches. This could amount to more than $100 million annually in tax-free contributions for politicking pastors. Gaylor notes that the pandering ceremony in the Rose Garden by the White House shows the ongoing harm of the National Day of Prayer, enacted by Congress at the behest of Rev. Billy Graham in 1952. FFRF won a resounding court ruling declaring the National Day of Prayer unconstitutional in 2010, in which the district judge noted: “The same law that prohibits the government from declaring a National Day of Prayer also prohibits it from declaring a National Day of Blasphemy.” The challenge was stalled when a court of appeals ruled against FFRF’s standing (or right to sue), not the merits, in 2011. “As Judge Barbara Crabb noted in that ruling, the government has taken sides on a matter that must be left to individual conscience,” Gaylor observes. The Freedom From Religion Foundation is a nonprofit membership organization that advocates for the separation of church and state and educates on matters relating to nontheism. It has more than 28,000 members, residing in every state of the United States, including more than 1,400 in Wisconsin, as well as members in the District of Columbia. FFRF is being represented by attorney Richard L. Bolton and FFRF Staff Attorneys Andrew L. Seidel and Sam Grover.